Clean Brass & Copper Dissolve tarnish and rise it away. No Odor and No Harsh Chemicals. Dissolve Tarnish and rinse it away right at the kitchen sink. EVEN THE MOST INTRICATE BRASS OR COPPER ITEMS. Safe for plated pieces too. Easy to use- apply with SUPER FINE #0000 steel wool ( this is your applicator and has very little abrasion -LESS THAN MOST POLISHES-so it will not scratch). Rinse the tarnish away with water at the kitchen sink. Dry thoroughly and buff with dry #0000 steel wool for a higher shine. Great for Cleaning Copper Bottom Pans . No residue in the intricate designs. No Rubber Gloves, No ODOR. Won't remove painted letters or designs. Very economical- one bottle will clean three times as many items as a paste or cream. 1 Bottle will clean as much as an entire tube of typical abrasive paste cleaners. 2 Bottles will clean an entire Brass Bed easily. See our Special that included the steel wool applicators. oh my! This is THE BEST brass polish! My Avalon woodburner stove brass door hasn't looked this nice since it was installed. Great product! Thank you and tell your friends there in Wisconsin. Love the ease of use, it does have to be rinsed well. Not just wiped off with a wet rag though. I took my brass pieces right to the kitchen sink and dissolved the tarnish and rinsed it away and then I used the dry steel wool and polished it a bit. VIOLA...clean and shiny and no black mess or residue in the intricate patterns on my candlesticks. I loved finding out it was made in Oklahoma and appreciate the fast service too. I was nearly ready to give up on my HUGE brass tray coffee table until I talke to the nice lady at the office. It took me two days but I did get it cleaned and it shines like it did when it was new. I did have a time getting the old crusty paste out of the intricate pattern and ended up using a toothpick and toothbrush--dont laugh it worked. I will never use a paste again. 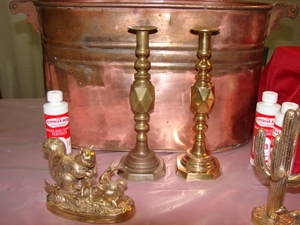 So easy Im looking for more brass to add to my collection again. Thank You for your time and your wonderful product. Easy to use and I love the fact I can use it right in the kitchen with no odor and no mess. I wasn't sure about the steel wool applicator but I figured out it saved me a lot of product and it gave me a bit of abrasion on the heavier tarnish. I loved the fact it left no junk in the intricate designs in my antique round tray.